and Tairua in safety. The track will follow, where feasible, the banks of the scenic Tairua estuary. Want to contribute to the Trail? We need funds urgently to get Stage 3 - Duck Creek to Hikuai - underway now that resource consent has been granted. Stages One and Two have now been completed. You can start at the western end of the Pauanui Waterways where the sign posted entrance is adjacent to the “Ian Hopper Memorial Rock”. Continue along the existing Coastal boardwalk and walkway, linking up with the new track at the northern end of Tangitarori Lane (about 1 km). The correct Maori name for Tangitarori is in fact Tangiteroria. Alternatively you can start the new track from the parking area at the end of Tangitarori Lane. The track continues on from there through the newly planted Thames Coromandel District Council, Memorial Forest, commemorating the Sinai – Palestine campaign of WWI. A short loop track starts just after the Forest. You can take the inland or riverside part of the loop and carry on, or you can simply enjoy the much shorter walk around the loop - about 1.2km back to Tangitarori Lane. The riverside part of the loop passes over boardwalks and through mangrove wetlands. If you choose to carry on, you will soon come across a small BMX practice area set aside for children. The track then follows the estuary along the south eastern side of the Tairua River up to Awa Whio Whio (Duck Creek). You will cross wetlands and a new bridge over the Tangiteroria Stream (Gumdigger Creek). The new track is just over 3km long and exits opposite the Lakes Resort entrance on Hikuai Settlement Road. The trail generally follows flat or slightly undulating country with a couple of short steep pinches. Additional work has been done to ensure a safe bench is achieved to meet grade 2 cycle trail standards. The numerous seats scattered along the trail recognize private donations which, in total, have made a very significant contribution towards the funding of the track development. Seats, with plaques acknowledging the donors, are installed for donations of $1,000.00 or more. The donations can be paid now and the seats reserved for the next stage of the track. These donations will be recognized in the meantime by plaques erected at the end of the existing track. The next stage - stage 3 - is now underway. Funding for this next stage is now a priority for the Trust. The Hikuai District Trust is a registered charitable trust that has raised funds for this and other projects within the local community. Donations to the Trust should be tax deductible. Plans for the future: A cycleway from Pauanui to Tairua. 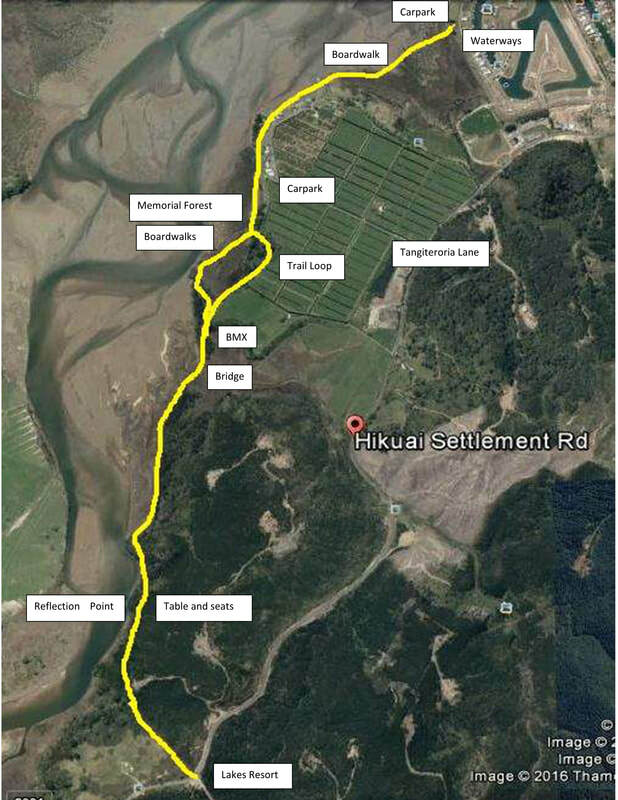 A track all the way down the north western side of the Tairua River and Estuary, is planned for the future. It will link up with the public access way from the Tairua Primary School into Tairua. Fencing will be erected and planting added to enhance the trail, where necessary. This track will provide safe access between the two communities of Tairua and Pauanui for residents of all ages. It will also be a huge asset in encouraging visitors to the area and will provide a spectacular tourist attraction. The track will compliment the Hauraki Rail Trail project and give access to the Puketui Valley mining sites which are popular with tourists and other visitors. Resource consent for Stage 3 has been granted and the Trust commenced work on this stage in April 2018.The Trust is currently preparing applications to various organisations for funding for the third stage. But private donations, no matter what size, will remain an essential part of funding requirements. Local contractors have agreed to assist. There is a large pool of local volunteers willing to be involved. Local iwi have been consulted. The Hikuai District Trust has appointed a committee of local people to organise this venture. ​ Dogs are a potential threat to birds and wildlife. Dogs are also at risk because poisoned rats and other predators might lie dead near the Trail. The Thames Coromandel District Council has recently put up more signs requiring dogs to be kept on leads. A disappointing percentage of dog owners fail to comply and we hope the extra signs will remind them of their obligations. The Team would like to acknowledge Ian Hopper's significant influence in bringing the dream of a trail to reality. Over the last few years as Ian's health was failing he still took an interest in the Trail and his input both as a mentor and a financial contributor will be remembered with gratitude. Ian and Tony Hopper developed Pauanui from bare land in the late 1960's. Ian had the foresight to propose the cycleway ten years ago. He started by building the initial kilometre from the Waterways, much of this in boardwalks over the mangroves. His vision for this track was instrumental in getting the project underway. Gary and Anne formed the Hikuai District Trust ten years ago so they could fundraise for the local community. During that time with their successful Concerts in the Orchard on their property. they raised $150,000 distributed amongst many worthwhile community groups including Rescue Helicopter Service, Surf life Saving, Pauanui Playcentre to name a few. Now with a very loyal team they are undertaking the fundraising and construction of the cycleway. Gary and Anne own a farm on the road into Pauanui and could see that a safe trail was needed for the many cyclists and runners using the busy road. Kim was secretary of the Hikuai District Trust and a former elected member of the Tairua-Pauanui Community Board of the Thames Coromandel District Council. Together with her husband Bryan, Kim has supported the Trust since its inception. Kim's expertise at keeping us all on track at meetings and being able to efficiently keep all of the paperwork up to date and on tap was nothing short of miraculous. Jeanette was the Fundraising Coordinator and creator of this website. Along with her husband Peter they bought their first section in Pauanui in 1974. Jeanette was a yacht broker in Half Moon Bay and then for 23 years sold real estate in the area. She decided that it was time to give back to a community that have given their family such great holidays and was motivated by the enthusiasm of firstly Ian Hopper and then Gary Fowler to get this Trail underway. Jeanette is thrilled every time some kind person gives money to the trail and makes her job a bit easier. I was delighted, recently, to be invited to join the team. Marian and I moved from Hamilton to Pauanui permanently in 2012 having spent our holidays in our home here since 2003. Working on publicity for the Trail is an enjoyable challenge. ​Barry took over as secretary after Marian retired in April 2018. Fred and his wife Shirley nee Prescott, a well known family name in the area have lived here for many years. Fred has given tirelessly to many activities in Pauanui including the Volunteer Fire Brigade, Search and Rescue and Rescue Helicopter Service. Retired mechanic ex army --he has developed lots of walking tracks in the area. Fred is an intrinsic part of the team and has put in many hours of hard physical work along with his workmate John McKenzie, to get this project underway Fred 'just gets the job done without a fuss'. Every committee needs a Fred. Andy isn't sure how he got involved with Trail construction in early 2015. He probably went out along the trail to see what was happening and was put to work. Andy was introduced to Pauanui in 1978 by his girlfriend and now wife Sue Christie. Sue's family had camped at the south end of Pauanui when it was still farmland and forest. Andy and Sue purchased their present home in 2001 and moved back to NZ from Perth in 2011. Andy trained as an engineer involved in construction and maintenance of offshore oil and gas facilities . Most of his career was spent working from marine construction vessels using divers and robotic intervention as they went deeper and deeper to install, repair or maintain these facilities. Who knows with Andy on board 'an under river tunnel' could soon be included in the future Trail plans. Peter and his wife Linda are now permanent residents in Pauanui They owned a boatbuilding business in Half Moon Bay, Auckland for 35years. Since they sold the business and retired Peter is still doing a few small boatbuilding jobs locally as long as they don't interfere too much with golf and fishing. Peter and Linda were keen to get involved with the local community and we are delighted to have Peter's expertise and enthusiasm on our committee and out on the Trail. Deb is the Trust treasurer and an indispensable team member. She works full time as a travel consultant and lives permanently in Pauanui. ​ If she doesn't give me a bit of information soon I will have to make it up. Taking on maintenance and enhancing the trail has meant a lot as I needed something to keep active and have a purpose. Like the rest of the team I'm looking forward to the next stage starting and like seeing the enjoyment that the trail has provided for so many. Marian's experience as a legal executive and practice manager will prove invaluable as she takes up the secretarial duties for the team in March 2017. Marian is looking forward to the short/medium term challenges the team has ahead of it in extending the trail to Hikuai.